Is Your Catch Basin Doing Its Job? Is your catch basin doing its job? Do you even know what catch basin is? The average person doesn’t unless they’ve had to have catch basin repair work done, or worse, catch basing replaced. Just to catch you up to speed – a catch basin is a part of a sewer system or storm drain system. It traps debris and keeps it out of the drainage pipes, which can cause back-up and clogs. A catch basin is the larger version of the drain traps that you see in your home under the sink, it simply can catch more. The majority of municipal sewer and storm systems utilize these, with some variations in them. 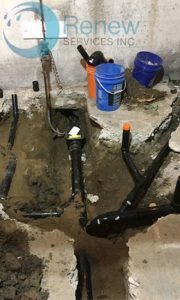 They often are repaired or replaced when there is sewer and water line replacement done. How Does A Catch Basin Work? Drain sections have a wide inlet that slopes and collects sewage and water runoff. They are larger than what is found in the typical home because there are higher volumes of water for a municipal area than an average home dumps into it. The inlet opens into a pipe with a grate which traps the large debris. When water floods into the catch basin, the smaller particles that have slipped through the pipe grate will settle to the bottom. A drainage pipe is located just above the bottom and ensures that there is sediment in the water that is flowing into the drain. A regular maintenance is recommended that include clearing debris from the grate and cleaning the trap as well. When particulates are permitted to build up high enough, they may spill into the drain and other serious issues can rise. After a rainy season, many cities will clean their storm drains and remove any sediment that has accumulated. Some catch basins are designed to prevent gas backflow from the pipes. The gas is a distinctive odor that builds up inside sewers and doesn’t rise. Some catch basins have features designed into them to deter rodents which are known to cause problems in drain and sewer systems. This is detected by camera inspections of sewer lines and water lines. Renew Services Inc. in Edmonton also offers Catch basin repair and replacements. Contact us today for emergency plumbing repairs.